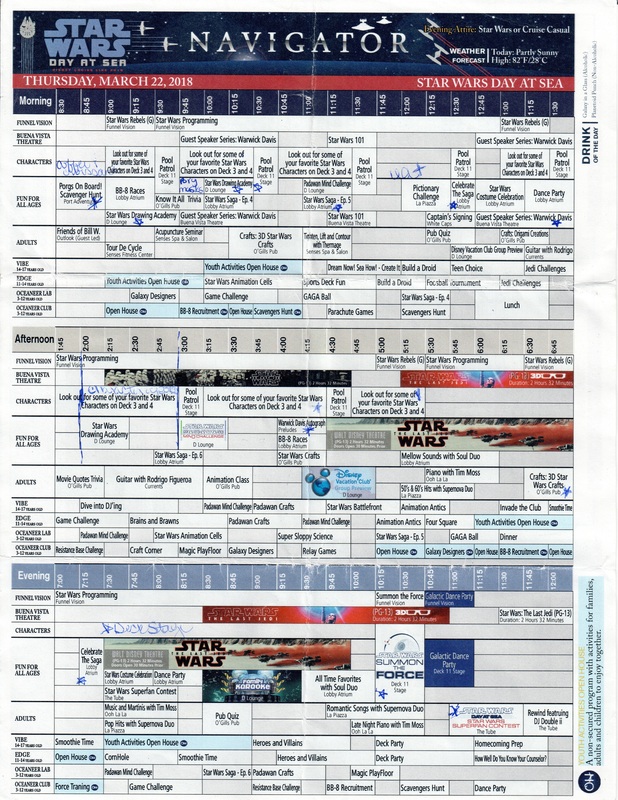 When we first booked this cruise, one of the biggest draws was the “Star Wars Day at Sea” aspect of it. For one day, all of the normal Disney characters get a break, and the ship is transformed into your own floating Star Wars world. We really weren’t sure what to expect, but were excited for the day to come! That little show is definitely a good way to get everyone excited for what’s to come the following day. 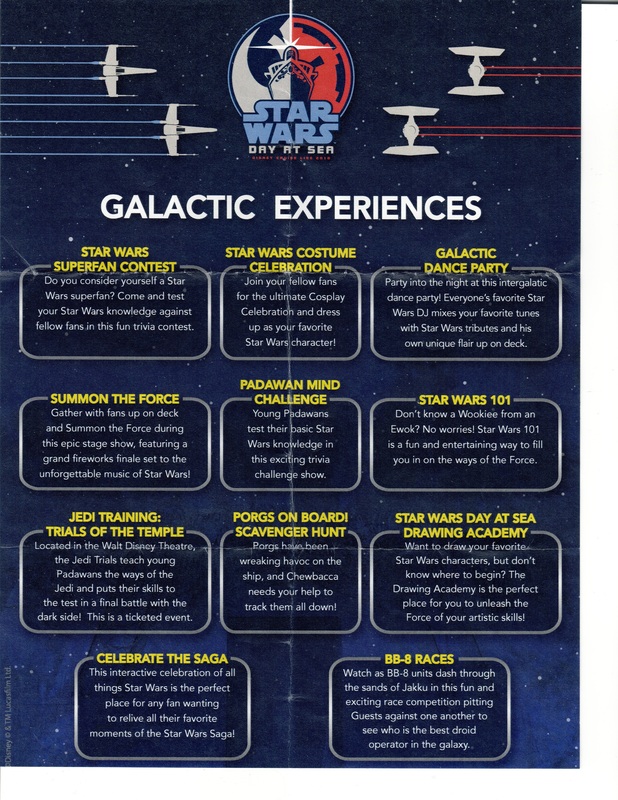 When we returned to our rooms, the Navigator for SWDAS was in our room, and as you can see, there’s plenty to do. We had no shortage of stuff to keep us busy! There are no shortage of Star Wars characters walking around all over the place during SWDAS, and we didn’t hesitate to stop them for pictures. They also never break character, which is kinda fun too. 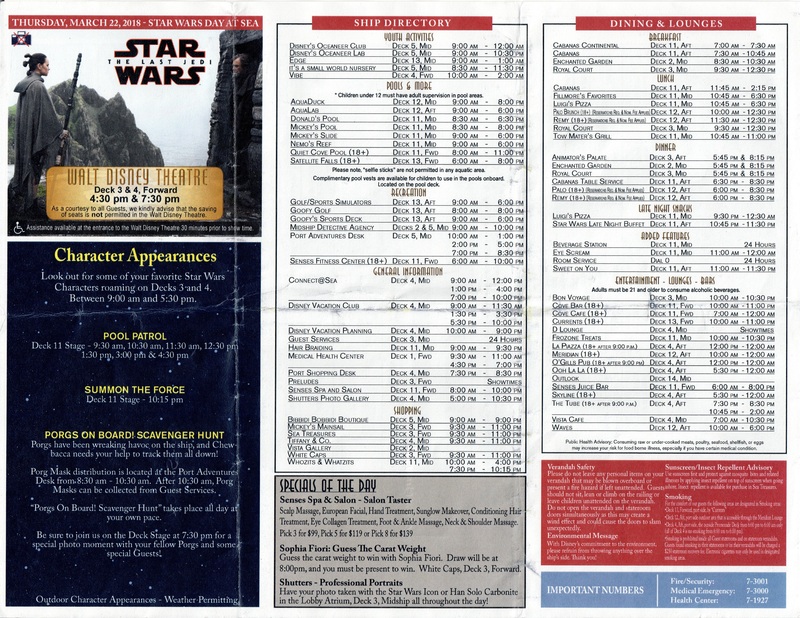 In addition to the characters walking around, there are meet and greets with the more popular ones, and even with our late booking, we managed to score tickets to all three of them, as shown in the post below. Click through to that 4th image, too, we managed to get a shot with Boba Fett and his prize! Moving on, each SWDAS they bring a special guest on for appearances, talks, etc, and ours just happened to be one of the coolest ones they’ve ever had, Warwick Davis! For those who don’t know, he played Wicket the Ewok, as well as holding several other major roles outside of the Star Wars universe. My wife was really excited for this, so after a stroll up on the main deck to see what was happening there, followed by a quick lunch in Royal Court, we headed to the theater for his afternoon talk. If you click through the images above, you’ll see a few shots from the talk, along with a couple of shots of us with him at his signing appearance a couple of hours later. Honestly, he’s a great speaker, and I found his talk to be the most interesting part of the day! That blue throw at the end of the bed with the SWDAS logo is yours to keep, no additional charge. I bring this up because I know of at least 4-5 people on our sailing who didn’t realize this (it’s not really called out, so I completely understand), and left it behind. Once it’s gone, it’s gone. A couple of people in the Facebook group for our sailing contacted Disney after the fact to see if they could get one shipped since they didn’t realize it was theirs to keep. Unfortunately, Disney doesn’t ship them out, they only make enough for each sailing, so if you leave it behind it’s gone forever, or at least until you sail on SWDAS again! Anyway, for the Star Wars show, we sat on the pool deck, just about dead center, which offered a decent view of the stage, and a solid view of the fireworks. It’s just super uncomfortable to sit there, and it doesn’t help when people who didn’t get up there early enough to get a good spot show up right as the show is starting and trample you trying to fit them and their kids into spots that don’t exist. Yes, this did happen, and a bunch of us refused to let the parents squeeze their way in after they shoved the kids into a space behind me that didn’t exist. I get it, you want to see the show, but seating is first come first serve, and the deck packs up pretty quick. Plan your time better so you can get there early enough to get a good seat, don’t be rude. Sorry, got off on a bit of a rant there, so to get things back on track, enjoy the fireworks! After making our crepes, we headed back to the room with them to chow down and get some sleep. We were pretty worn out from the day’s events and wanted to get some rest before Castaway Cay the following day. This visit to their private island was pretty similar to our last one, so I won’t be covering that this time, but just know that we had fun, and still consider it to be one of the best private islands around. If you’re a Star Wars fan and have the chance, I strongly suggest taking in a SWDAS sailing, you won’t be disappointed! We really enjoyed the day and wouldn’t hesitate to sail again! Next up: Tomorrow we head to Dubai for a few days followed by a week in the Maldives to celebrate our daughter’s college graduation, so feel free to follow us on Instagram, Facebook, or Twitter and check out all the fun!